Hedge trimmers powered by gas engines are one of three different types you can buy along with corded electric or cordless. The main advantage of gas trimmers is that they provide the most power of the three types. They also give you maximum range and generally a longer run time than cordless versions. The downside is that power comes at a cost. They are the most expensive type ranging from about $150-$300. They also are the loudest, heaviest, and require the most maintenance. 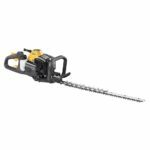 We recommend a gas powered model for those of you have heavy-duty requirements like a professional operation or someone who has a large property with thick branches to trim back. Below we review our top 5 best gas hedge trimmers. 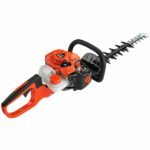 Below these gas hedge trimmer reviews we also have a comparison chart so you can easily compare on model versus another. We chose the $300 Echo HC-2020 as the best gas powered hedge trimmer. Powered by a 21.2cc 2-cycle engine and with 20-inch professional-quality double-sided, double-reciprocating razor sharp blades this thing can cut clean through branches up to 1-inch. It is pretty easy to start and dependable. The HC-2020 weighs 10 pounds without fuel and has a 5 year consumer or 2 year professional warranty. Other features include a commercial duty air filtration system for long engine life, tip guard to reduce blade tip wear when cutting near the ground or walls, and large rear handle for comfort. 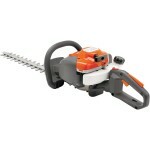 A close second choice for us was the $300 Tanaka TCH22EBP2 hedge trimmer. This thing is commercial grade starting with its 21.1cc 2-cycle engine designed for ultimate reliability and durability. Quick and easy starts come from a purge bulb and S-Start which reduces the amount of pull force it takes to start the engine by 50%. The TCH22EBP2 has 24-inch long dual reciprocating blades that can chop through branches up to 3/4″ without a problem. The rear handle adjusts to 5 different positions for maximum comfort during use. Weighing 10.3 pounds it is also backed up by a 2 year commercial or 7 year consumer warranty. Since the Tanaka TCH22EBP2 is the most expensive gas powered hedge trimmer on our list, unless you truly need a commercial quality unit then you could choose a cheaper model. The best selling gas hedge trimmer on Amazon is the very affordable $155 Poulan Pro PR2322. The 23cc 2-cycle engine is reliable and starts pretty easily. The stainless steel dual-sided serrated blades cut swaths up to 22” wide and limbs up to 1” diameter. It has a rotating rear handle and an effective anti-vibration dampeners that absorb vibration for reduced operator strain and fatigue. At 11.1 pounds it is a bit on the heavy side. One problem that some users have had is with the starter pull cord either becoming stuck or not working properly. Poulan Pro offers just a 2 year warranty as well which is less than some of the more expensive models, which makes us question how dependable all the parts are. If price is of utmost concern and you want a gas powered hedge trimmer then the Poulan Pro PR2322 should be first on your list since it is the cheapest gas trimmer. The cutting performance is really good, however, we question just how long this thing will last in perfect working order. The Husqvarna 122HD60 costs $269. It has a 21.7cc 2-cycle engine and heavy duty 24-inch long blades that can handle branches up to 4/5 of an inch. The rear handle is adjustable and it also has very good anti-vibration dampeners which really helps reduce fatigue in your hands and arms. The Husqvarna 122HD60 is a solid performing hedge trimmer, however one common complaint from buyers caused us to ding the rating a bit. Several users have said that the fuel return line can degrade and should be replaced, although some have had no issues at all. 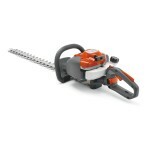 At $265 the Husqvarna 122HD45 is very similar to the 122HD60, but has 18 inch long blades instead of 24. It has a 21.7 cc motor that is relatively quiet for a 2-cycle. At just over 10 pounds it is not too heavy either and users also like the fact that the exhaust vents to the front. It cuts very cleanly and fast with a cutting capacity of 4/5″. When working it is a solid performer, however again some users complained about the construction quality including the faulty fuel line.